Newport artist Cynthia Jacobi creates with watercolor and mixed media. Often inspired by Oregon nature, she gravitates towards the shapes of salmon, birds, ferns and coastal landscapes. She paints because it activates creative endorphins – the time when an artist transfers energy to the medium. “It is like playing in a sandbox of paints,” she says. On occasion, her work has been focused on serious political themes of women, war and children. She loves watercolor for the luminosity and the wonderful surprises formed as pigments puddle into the paper. 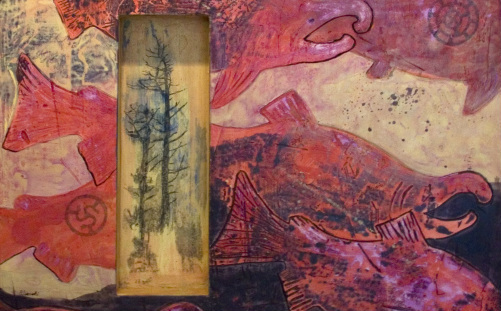 From mixed media, she loves textures, and the feel of patterns from nature pressings and found objects. Her palette tends to be warm as red is her favorite color - from earthy reds of landscapes to brilliant roses in salmon. “Although,” she explains, “my newest series with photo transfers onto plaster of my Grandmother is in black, white, and cool blue gray.” Her favorite tools are a handful of brushes for watercolor, and for mixed media, a nail and hand-made stencils. Her latest mixed media fish incorporate vintage fishing lures. She usually starts with a sketch and “thumbnail” to establish design and contrast. Knowing when a painting is done is a challenge. She often displays the painting at home and looks at it several times a day to help decide when to quit or start over. Using a photo can help find values. Cynthia’s goal is to paint honestly with her own ideas. It is icing on her cake to capture an emotional response with the viewer. 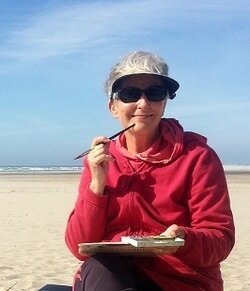 She is a member of the Watercolor Society of Oregon, For ArtSake Gallery, and the YAA. Through the Toledo Arts Guild she participates in teaching after-school art classes. She is also a poet and board member of Writers on the Edge. Her most inspiring instructors have been Bill Kucha and Eric Sandgren (watercolor), Pat Wheeler (mixed media) and Mary Fox (acrylic and color mixing).